Need to Drug Test Your Staff? Safety in Mind offers Northland’s first ConstructSafe Test Centre: a global initiative designed to offer peace of mind for employers through benchmarking employee operational health and safety knowledge. ConstructSafe Test Centres are able to assess each employee across a range of knowledge for their industry, using a unique online interactive testing system. As Whangarei’s first accredited ConstructSafe test centre, Safety in Mind are pioneering this efficient and well-developed system throughout Northland – with outstanding results. Whoever thought up Enable HR is a genius. Pure and simple. 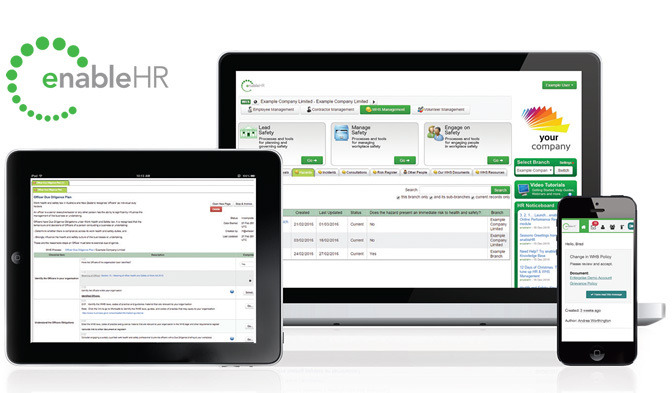 This online health and safety and human resources system is beautiful; it offers a subscription-based toolbox of HR and H&S documents that every employer needs to have, from contracts through to regulations and guidelines, Enable HR has it all. Why Choose Safety in Mind? Of course, it would be easy for us to say you should choose us because we’re the best. The problem is, however, that that’s not the reason you should choose to partner with us at all. Obviously, it helps that we’re experts in our field, and that we have the experience and know-how to ensure that your team receives the best health and safety service possible – but that’s still not the reason you should choose us. And we wouldn’t expect you to choose Safety in Mind for our outstanding customer service, our personalised training options, or our ability to tailor drug and alcohol policies to suit your industry and business needs – not at all. But, we hear you asking, what’s left? Having Helen manage all my employment needs is a real bonus. She takes care of my payroll, staffing issues and any questions that I have to ensure that I am doing everything correctly and meeting my obligations as an employer. This helps me to grow a team of happy staff that are treated right, love their jobs and benefits my business to no end! Call Helen to manage your HR needs while you focus on the important stuff.